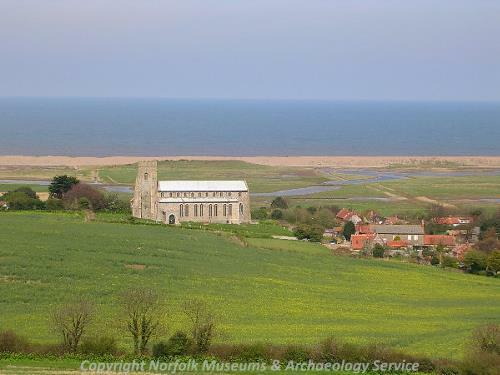 The north Norfolk coastal parish of Salthouse is situated west of Kelling and east of Cley next-the-Sea. Its name comes from Old English and Old Norse for ‘house for storing salt’. There has been a human presence in the area for a very long time, and settlement was long established by the time of the Norman Conquest, the parish’s population, land ownership and productive resources being extensively detailed in the Domesday Book of 1086. Setting aside those objects found which are prehistoric but undateable, the earliest evidence of activity in the parish comes in the form of a Palaeolithic flint flake (NHER 6191) and a handaxe (NHER 6198). Mesolithic finds include a flint burin and scraper (NHER 6192). Neolithic flint finds are more plentiful, and include flaked and polished axeheads (NHER 36694 and 43197), arrowheads (NHER 6196 and 6197) and harpoon barbs (NHER 14855). Aerial photography has tentatively identified the cropmarks of what may be evidence of the earliest structure, a possible causewayed enclosure or henge (NHER 36398). 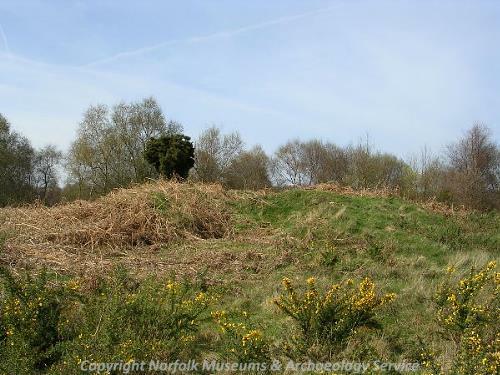 The most remarkable survival in the parish from the Bronze Age is the largest barrow cemetery in Norfolk, on Salthouse Heath and Common. This consists of a group of at least nine large bowl barrows, including Three Halfpenny Hill (NHER 6202) and Three Farthing Hill (NHER 6203) and a large number of small mounds (for example NHER 6204 to 6212). Their survival in good condition is rare and due entirely to the unsuitability of the underlying soil for agriculture, meaning, unlike pretty much everywhere else in the county, most of the area has never been ploughed. The majority of round barrows elsewhere have been flattened by centuries of cultivation and are only visible from the air as circular cropmarks. Recent fieldwork has identified hitherto unknown small barrows on the Heath (for example NHER 39419, 39420, 39422 and 39426), and aerial photograph analysis has pinpointed still more (for example NHER 27966 and 27967). 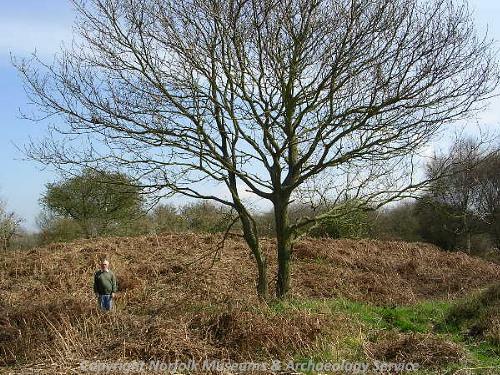 The largest and probably earliest barrow in the whole cemetery, Gallows Hill (NHER 6201), is actually over the parish border in Kelling. Iron Age finds are not common, but those that have been recovered include pottery fragments (NHER 29071) and coins (NHER 43197 and 6214). On the coast in the northeast of the parish on Gramborough Hill is the site of a possible Roman signal station and kiln (NHER 6214). Excavations and casual finds since the early 19th century have recovered traces of Roman buildings, Roman coins, pottery fragments and other finds. Quite a few Roman objects have been recovered elsewhere, including coins (NHER 29071 and 29665), brooches (NHER 36684 and 43197), pottery fragments (NHER 6215 and 13646) and a small coin hoard and seal box (NHER 43197). Saxon finds are brooches (NHER 31214 and 43197), buckle frame (NHER 36694) and a strap end (NHER 34997). The medieval period has left the parish with its oldest surviving building, St Nicholas’ Church (NHER 6238).This church is a handsome example of late Perpendicular style, having been rebuilt by Sir Henry Heydon in the late 15th century. The west tower is from the earlier church, traces of which can be seen to the north, and has bell openings. The rest consists of a clerestoried nave and chancel in one with north and south aisles and a leaded roof, and north and south porches. The interior is full of light, with tall and narrow aisles windows and an enormous east window. Most of the tiled floor is original. The splendidly preserved 15th century carved octagonal font has evangelist and passion symbols on its faces and smiling lions at the angles. The remains of a repositioned screen have painted saints, and on their rear, graffiti of ships, which can also be seen on the choir stalls. In the graveyard outside, which has interesting gravestones, a ruined chapel was excavated in the 1930s. Two medieval stone crosses (NHER 13391 and 13392) are marked on a map of 1649, but no trace of them remains today, although the base of a cross in the garden of Manor House (NHER 13393) may have originally come from one of the sites. Quite a few medieval objects have been recovered, including pottery fragments (NHER 6217, 33795, 34998 and 36579), buckles (NHER 34997 and 36684), coins (NHER 34997 and 36684), seal matrices and a strap end (NHER 44040), jettons (NHER 34997), a harness fitting (NHER 29665), a jug lid (NHER 36684) and a badge (NHER 44083). Of the post medieval buildings to survive, Salthouse Hall (NHER 16024) on Bard Road is the oldest. This is an early 17th century two storey brick house, perhaps with an earlier core, with a black glazed pantile roof and 18th century refacing. At the rear are two two storey wings, the one to the right of 17th century origin, the other late 19th century. The hall stood empty for a number of years, but was sympathetically restored in the 1990s. Peartree Cottage (NHER 40076) off Cross Street is the former parish poorhouse, dating to about 1859. 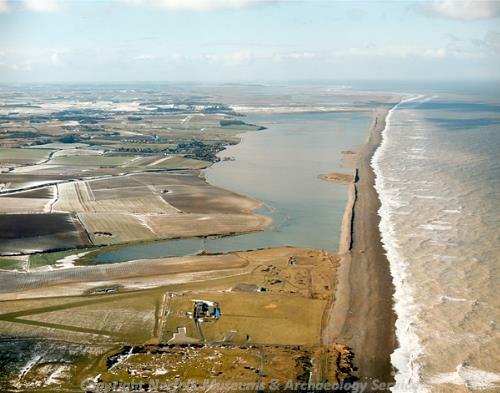 Other post medieval structures noted include Andrew’s Wall (NHER 39689), a section of probably early 17th century flint, brick and mortar former quay wall, now some distance from the sea, and the remains of sea defence banks (NHER 27138 and 27186), visible on aerial photographs. Other post medieval structures have not survived. Salthouse Windmill (NHER 36047) is marked on a map of 1826, but it was blown away later that century. NHER 39768 is the site of a 19th century tower mill. Apparently during the 1897 floods the miller climbed to the top of the isolated mill to escape a gang of panicking rats. The top of the mill was blown off during gunnery practice in World War One. All that survives today is an earthwork mound. During World War One there was a perception of possible enemy invasion along the Norfolk coast, and a series of concrete pillboxes and other defences were built. A pillbox from this period (NHER 32467) is marked on a map of 1928 on the north coast of the parish, but has since been destroyed. However, in 1940 during World War Two, the threat of attack was very real and a massive programme of defensive construction was carried out, consisting of a coastal crust and various inland stop lines along rivers, canals and other natural obstacles. 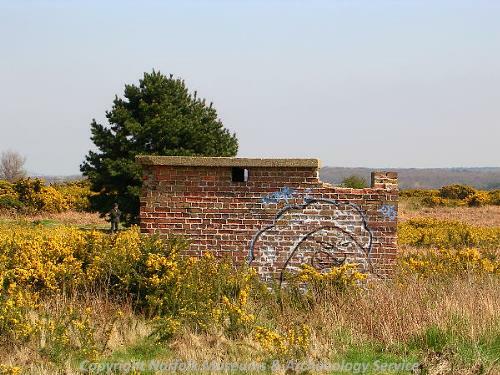 The heaviest anti-invasion defences were concentrated on the coastline, and in Salthouse included pillboxes (NHER 16006 and 32466), gun emplacements (NHER 19389 to 19395), anti-tank mortar emplacements (NHER 32480), an anti-aircraft battery (NHER 35554), barbed wire obstructions (NHER 27867) and an air raid shelter (NHER 31923). These are just selected examples; the sheer scale of construction can be seen on aerial photographs taken during the war and immediately afterwards. Most of these defences have since been removed, but some still can be seen, including pillboxes (NHER 16007, 16027 and 32472), anti-tank mortar bases (NHER 31785 and 32478), anti-tank cubes (NHER 32464 and 32481), a tank trap (NHER 32465) and traces of buildings on the former Bards Hill radar station (NHER 23386). Also surviving are rare slit trenches (NHER 32461) and an equally uncommon Alan Williams turret (NHER 24186). The most historically recent entry on the record is a Royal Observer Corps Cold War underground monitoring post (NHER 16029), designed to measure fallout in the event of a nuclear strike. Situated east of Snipes Marsh, it was opened in 1958 and closed in 1968. The side of the hill under which the post stood was cut away to form the current structure, converted to a bird hide in 1975. An earlier above-ground observation post stands to the north. P. Aldridge (NLA), 16 July 2007. Knott, S., 2005. ‘The Norfolk Churches Website’. Available: http://www.norfolkchurches.co.uk/stiffkey/stiffkey.htm Accessed 12 July 2007.